Handel Street Projects is very pleased to be able to host an evening with Gavin Bryars Ensemble. Bryars’ extraordinary life dedicated to music goes back to the mid 60’s when he was bassist (one of the best in British Isles) in the Joseph Holbrooke trio, alongside guitarist Derek Bailey and drummer Tony Oxley, while keeping up an interest in everything from Beat poetry, to the music of John Cage and Morton Feldman and the philosophy of Ludwig Wittgenstein. Bryars taught university courses on Duchamp and Jasper Johns, he was a founding member of the famous Portsmouth Sinfonia (its members included Brian Eno, whose Obscure Records label would later release works by Bryars) but also performed with popular artists such as Tom Jones, Dusty Springfield, Alma Cogan, Vera Lynn, Dickie Valentine and Des O’Connor, among others. He also collaborated with many visual artists including Bill Woodrow, Tim Head, Juan Muñoz, with whom he wrote A Man in a Room Gambling (1992-2005). His interests are, in his own words, ‘search for some kind of middle ground’. 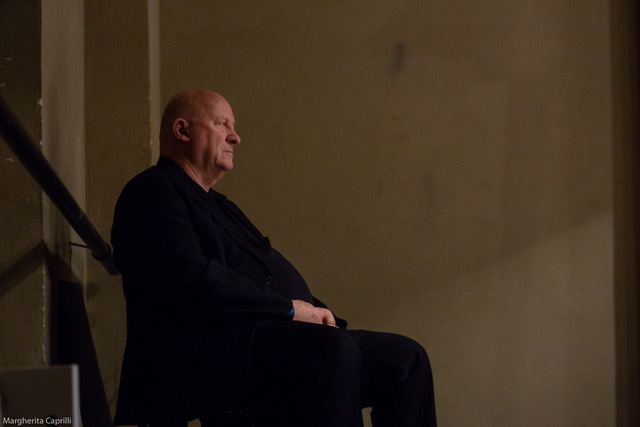 As a composer, Gavin Bryars is sort of a conceptual artist, thoroughly researching his work. For one of his early pieces, The Sinking of Titanic (1969), he found out who were the musicians on board, what instruments they played and what music they performed when the ship went down. The music is difficult to classify. Bryars is particularly interested in the music for voice. Medea(1982-4), an operatic collaboration with Robert Wilson, being one of the first, to his fifth opera Collected Works of Billy the Kid, recently premiered in March 2018 as well as more than six books of madrigals. He won a 2018 Grammy Award for Best Choral Performance with his The Fifth Century (2014), for choir and saxophone quartet and is currently writing more choral music. For the concert at Handel Street Projects, Gavin has chosen to perform an ‘austere’ version of what is probably his best known piece, a four line religious song, Jesus’ Blood Never Failed Me Yet, we will hear two of his beautiful Laude based on 12thcentury, quasi religious songs from Cortona, sung outside churches as a call for prayer; It Never Rains(2010) commissioned by Cold Blue Music which borrows its title from Beach Boys’ song It Never Rains in Southern California and the English expression ‘It never rains but it pours’; Dancing with Pannonica (2012) relates to the solo piano music of Thelonius Monk for whom Pannonica was the nickname of Baroness Nica Rothschild who was Monk’s patron for many years and in whose apartment Charlie Parker died; Epilogue from Wonderlawn (1994) an extended lullaby originating in a dance collaboration, but written ‘specifically for the qualities that my own players bring to this music, a kind of song-without-words for solo viola’ (G.B.). We are so privileged to have a premiere of Gavin’s new piece Added Time composed this summer in Italy, which features the fine sustained qualities of James Woodrow’s electric guitar, a key element in the ensemble’s repertoire. Its starting point is a piece for solo vibraphone, played with two double bass bows, written for percussionist Evelyn Glennie’s 50thbirthday.